Finally, winter is slowly releasing its icy grip on me. While the weather is still quite cold, the overnight temperatures are slowly creeping up towards and above the freezing point. This means that my equipment will finally start working properly again. And that means, new picture-taking opportunities! Over the past couple of years, I’ve been taking pictures of pretty random objects. I have a few favourites, but everything else was basically a target of opportunity. And with that, I managed to get some pretty good shots overall. That said, I was ill-equipped to shoot some of these targets. I went several months without my prized 8″ Meade LX90 while it was off for repair (all last summer). I was limited to using my SkyWatcher 120mm refractor instead. While this little refractor is an awesome scope in every sense, it shows significant chromatic aberration with longer exposures when there are bright stars in the field of view. I learned a lot while using this scope, and will probably continue using it for specific applications. But this year, my real work horse for high resolution imaging will be my LX90. Even when I got my LX90 back last August and mounted the optical tube on my Celestron AVX mount, I was still limited to exposures of 90 seconds or less due to my inability to track accurately for longer than that. I got some really nice images out of it, particularly when using my 0.63x focal reducer, but I was still limited by short exposure times. Now I have a guide scope and camera. I can take exposures of whatever length I need. Since getting the auto-guiding setup, I’ve only managed to use it twice. At that point, it got so cold that none of my equipment was working right, so I had to partk it for the winter. But in those two sessions, I managed to take what I think is a pretty stunning image of The Orion Nebula – what I consider to be my best image ever. 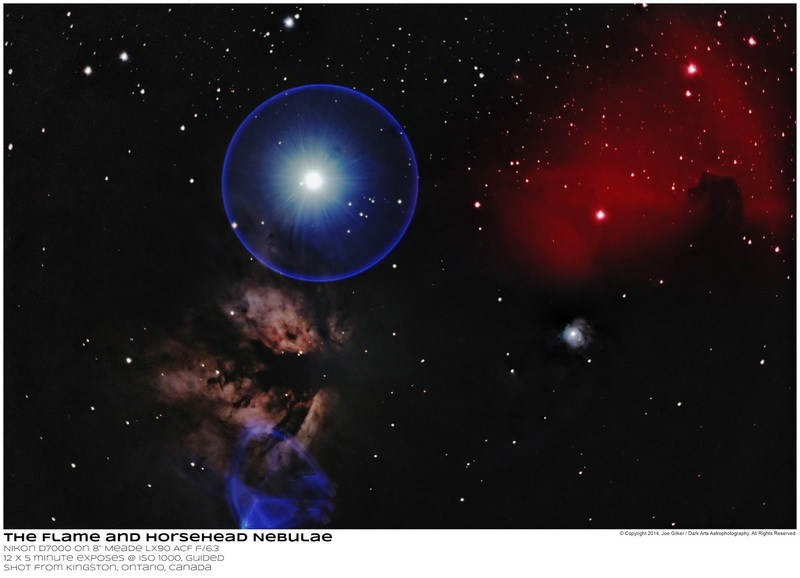 I also managed to get a nice shot of the Flame and Horsehead Nebulae. Clouds rolling in cut that last session short, but I was very pleased with the data I got. One thing I was displeased with in these 2 images is the large blue ring introduced around bright stars by my Meade focal reducer. I’ve now replaced this focal reducer with a Celestron model that should work without producing this blue ring. M51 The Whirlpool Galaxy – I will finally be able to attempt to get a high resolution, long exposure image at f/10. Other than my original astro image discussed in my last blog entry, I’ve only ever successfully photographed this galaxy in wide field using my f/5 refractor. While the images were nice, the resolution was nowhere near where it needed to be to really show the finer detail I wanted to see. M81 & M82 Bode’s Galaxy and Cigar Galaxy – Widefield long exposure @ f/6.3. I got my first shot of this pair last summer using my f/5 refractor. The image is a bit fuzzy due to poor seeing, but I was quite pleased to be able to capture this pair under light polluted suburban skies. I also managed to get another shot of the pair later in the fall using my LX90 @ f/6.3. But I was limited to 90 second exposures due to not having guiding. The results were nice, but I know I can do much better than this. M16 The Eagle Nebula – For this target, I need to get both a widefield f/6.3 of the entire nebula and also want a high power view of the core at f/10 to clearly capture both The Pillars of Creation and The Spire. 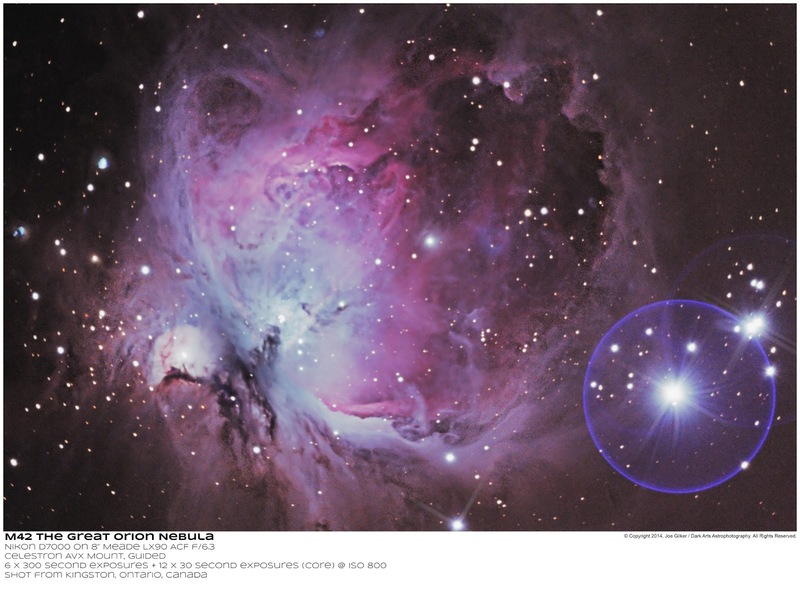 My 2 attempts at this nebula last summer were using my f/5 refractor. I got some decent shots, but the chromatic aberration dure to the multitudes of bright starts in the field of view kind of ruined the overall image. M57 The Ring Nebula – Need to get a good, high res image of this at f/10. I’ve gotten a couple of decent pics of this with each of my scopes. But I’ll finally be able to capture the image I want. M8 The Lagoon Nebula – Need a nice f/6.3 shot of this. I was thrilled to get a semi-decent image of this last summer with very short integration time and light polluted skies. I need to improve on it and shoot it from a dark site this time. M27 The Dumbell Nebula – This is a beautiful planetary nebula. I got an hour worth of short exposures last summer @ f/6.3. This year I need to hit it with long exposures at f/10 to really capture the fine detail and clearly capture the central star. Jupiter – This has been a pretty elusive target for me. At the peak of its visibility last summer, all I had was my small refractor, making planetary work rather useless. I managed to get some shots through my friend’s 8″ SCT, but by then, the giant planet was very low on the western horizon at sun set, making it less than ideal to shoot. I got 1 successful image of it last fall that I’m happy with, but it was still low on the horizon at the time. I know I can do MUCH better than this. I also plan to create a time lapse video of it over the span of a couple of hours. Saturn – the same situation as Jupiter. By the time I got my LX90 back, it was too low on the horizon to get any clear shots of. Although a few of my attempts at it did yield some acceptable results. So this is the short list. These are all objects I’ve captured before, but never quite to my liking. And of course, this isn’t the full list. I look forward to capturing as many objects as possible in the coming months. And as summer rolls around, I really need to put my 14mm f/2.8 fish eye lens to good use and capture the Milky Way like I was never able to before. So that’s all for now. Thanks for reading.